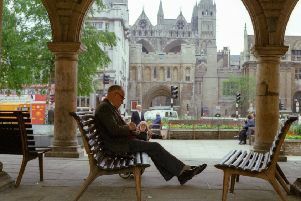 Local historian Stephen Perry has produced the latest in his excellent series of booklets on Peterborough. Park Road And The Park is the sixth in his local history series and features some great pictures and a fascinating narrative. The booklet was launched on Saturday (November 18) at 11am at the Butter Cross in Central Park. At the same event the PT’s Paramedic Paparazzo Chris Porsz announced the winners of the Yvonne Lowndes Memorial Photographic Competition, featuring pictures of the park. Stephen tells us Park Road was laid out in the late 1870s and early 1880s and became the site for shops, churches and homes including Clifton Villas where one of the most famous Peterborians Frank Perkins was born. Central Park itself was originally a private enterprise for which season tickets could be bought. In 1908 it was transferred to the city council and became a key leisure amenity for all city residents. Today’s pictures are all taken from the booklet. Does anybody remember the tank? Does anyone remember the tank?